I really enjoyed doing this review of James Stokoe's Avengers issue, especially the bit at the end, where I pulled my 3 favourite panels and talked about them a bit. So I decided to make a little feature out of it: introduce a book and its authors, with a brief overview/outline of plot, and then pick out 3 panels from it to deconstruct and chat about. 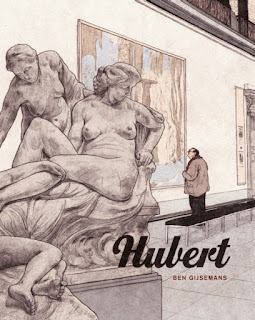 It's not intended to be anything deeply analytical, but it allows me to talk about comics in a different, hopefully snappier, way, while perhaps also introducing people to work simultaneously. This was Tatsumi's first book drawn at 21, and it's very loose and rough, and it shows, but it's also truly charming in it's simplicity and that much easier to engage with. The main merit to his cartooning here is the dynamism and expressive-ness -were it not for the blizzard which requires texture and shade to obscure, and to portray the weather conditions, it's ligne claire like in tone and style. This is panel from the beginning of the book, where the nameless long-term criminal is rather pointedly laying down the law for Susumu. I just really like how the wind is blowing Susumu's hair straight up and the scrunchiness of his face, offering the objection he daren't state. 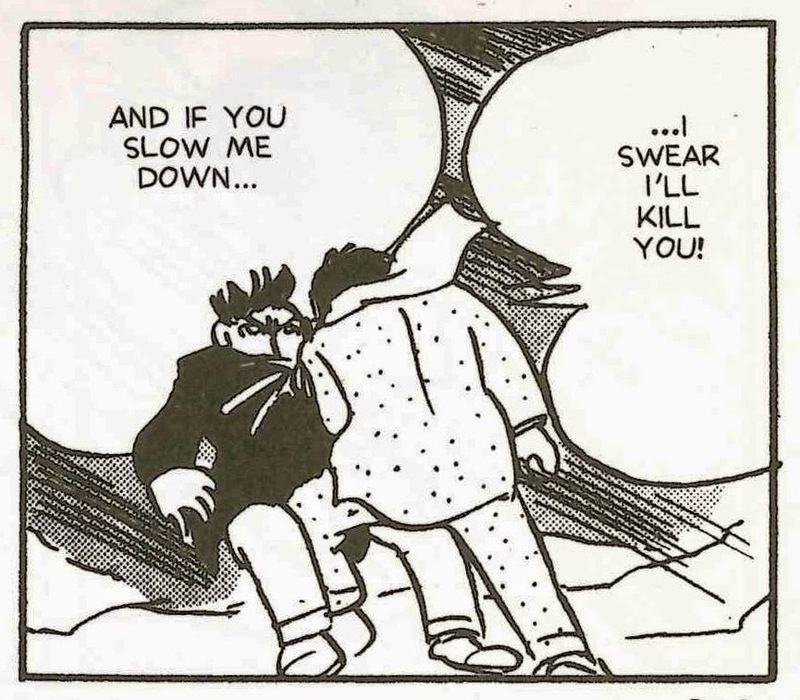 It's an example of the early roughness, as well: in this panel it's clear that Susumu's right hand is free, meaning his left must be handcuffed to the man's right, although his hand is clearly visible here and looks free- not to mention how long Susumu's arm must be! One of the things I love about Black Blizzard is the humour in it- it's not overt, but it's present- in the guise of the odd pairing of the hapless Susumu and the hardened career criminal. Tatsumi does a deft job representing that via body language, features, and expression. Nowhere is this more apparent in the initial escape where Susumu is continually tripping over and protesting that he can't go on. I love the way he's fallen here -it's a flop, essentially- and that one leg that's just popping up, accompanied by the 'whump' makes it. It looks like his arm is reaching up, but it's stretched into that position because they're handcuffed together- a complete submission- he's given up. And the 'what is this?' disgusted expression on the thug dude's face as he looks down at the specimen in front of him- it just really tickles me. Another fairly straight-forward panel; there's no minute detail here, it's all about the characters, ostensibly -and the blizzard. 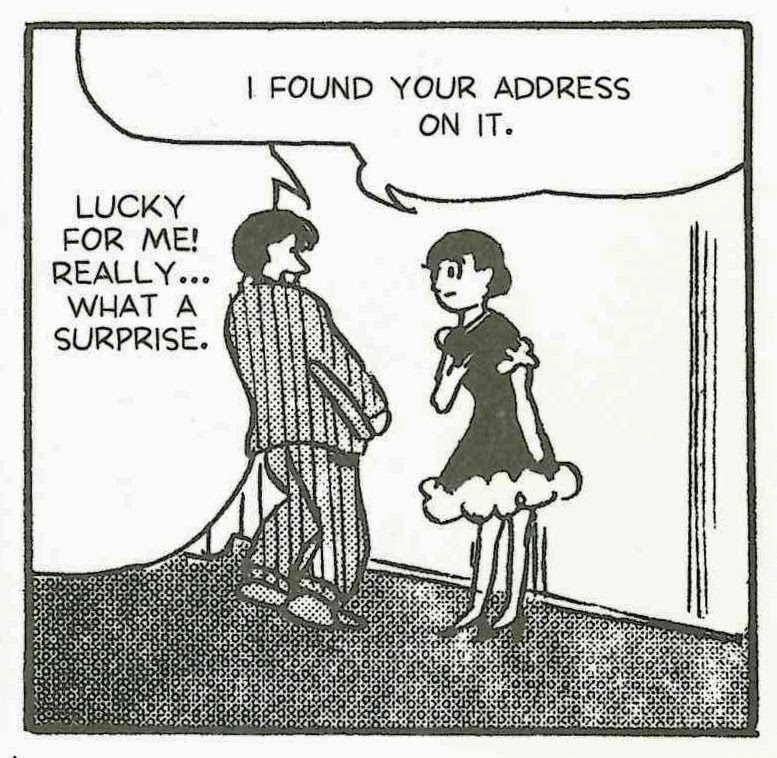 More love for Susumu and his adorably, awkward ways: this is only his second meeting with Saeko (his first whilst sober), she's come to his home to return his book. The little character gestures here get me: Saeko's arm on her chest in earnestness and the lovely bubble dress, she's composed and calm and proper, while Susumu's all a-flutter: flustered, leaning forward, great big grin, those bandy legs doing their thing as he clutches the book. It's such an acute depiction of an early encounter between 2 people who like one another. Black Blizzard is published in English by Drawn and Quarterly, and if you haven't read it yet, I'd very much recommend doing so- Tatsumi never really produced another work like this, although he was to continue to extend and expand upon the themes of the lives of the working class and the injustice they faced, to high acclaim.